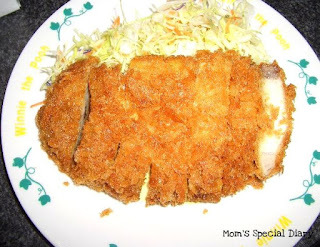 Mom's Diary: Food Trip Friday-Homemade Beef Tongkatsu. Food Trip Friday-Homemade Beef Tongkatsu. Tonkatsu usually served with rice, miso soup and tsukemono in the style of washoku (traditional Japanese food). Recently, some establishments have taken to serving tonkatsu with the more traditionally Japanese ponzu and grated daikon instead of tonkatsu sauce. sis, Thanks for joining, alam ko you're on "blogging leave" I'm surprised nag join ka pa rin.Thanks a lot,I appreciate it.Have a wonderful weekend!!! missed you, too, Jac...and have a great weekend! Looks like its a breaded beef. I like breaded stuff :) Delicoius food you got here sis. oh lala...salap naman tong entry mo sis....first glance ko kala ko chicken...ehehehhe....beef pala! musta na? been a long time...ehehehhe...ingat! I tried that when I ate at Tokyo Tokyo and it's really good... Happy FTF Jac! I soo love tonkatsu,Mommy Jac and my kids loves it,too!Alam mo na mahihilig sa mga mamantika lol! Jap food is always good... whatever they're called haha! Sarap! andito me ulit sis...salamat sa dalaw! Yay sarap ng food mo dito sis. ginutom ako. Hello Jac, thanks for visiting My Food Trip: Buttered Shrimps.. :) sowe it's just now that I came here and return the visit.. Anyway, your entry is so Japanese.. ano kaya ito sa English or tagalog.. hehehe.. looks like it's pork chop, kaya lang beef, pwede kaya beef chop? nyahaha.. thanks for sharing Jac.. muahhh! You know I really love miso soup. It's been a while since I have one. That goes very well with every Japanese dish, right? Your homemade beef tongkatsu looks great!